REVIEW - Back To Bed - Use a Potion! Videogames are amazing things. Throughout their history they have allowed the expression of people’s most weird and wonderful ideas. Of those I’ve played Back to Bed from Bedtime Digital Games contains some of the most ‘out there’ ideas I’ve come across. 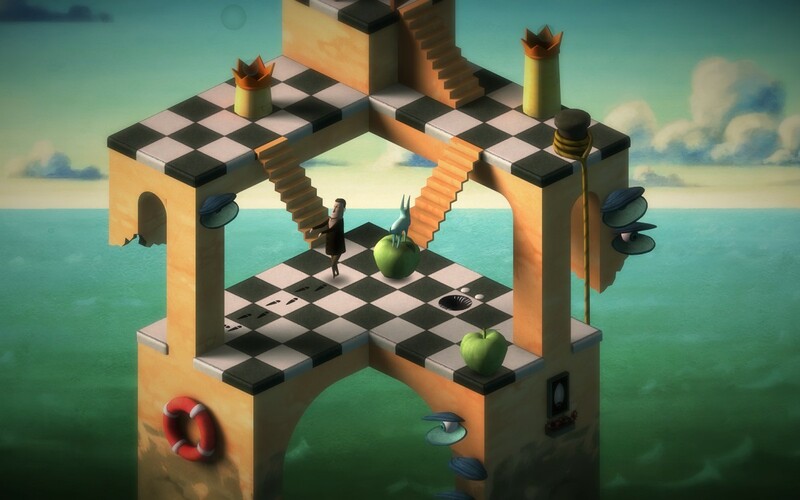 At its most basic Back to Bed is simply a 3D puzzle game with a small amount of possible inputs – pretty standard stuff. However, with a layering of odd personality and some freaky design concepts it becomes significantly more. 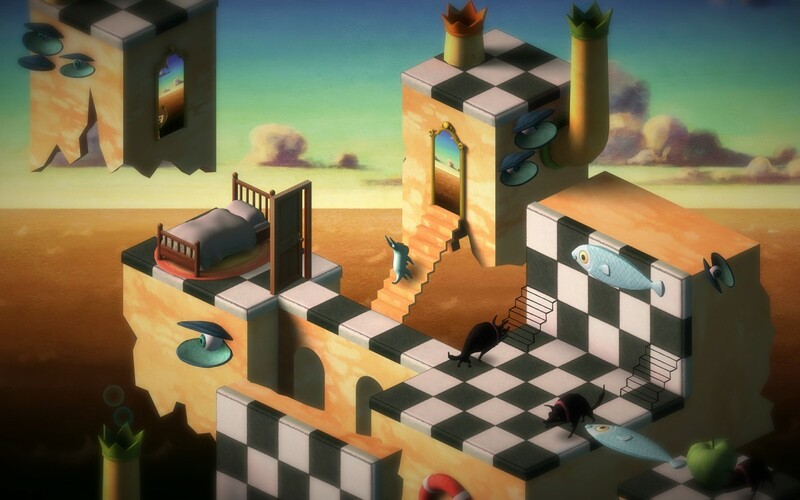 The premise of Back to Bed is pretty much as the name suggests; you guide Bob, the games protagonist, back to bed via manipulation of his dreams (which have produced a dangerous surreal world). You control Bob’s subconscious, the imaginatively named Subob – a seemingly spandex clad dog/rabbit/gimp monstrosity. He wanders around this world using roadblocks (an oversized apple…) and bridges (a sky blue fish cutout…) to clear obstacles in the path of Bob’s continuing quest to Noddyland. The game follows a level based format where each level forms part of one of two greater areas. As you would imagine progression through the levels brings an increase in difficulty as well as introductions to further character inputs or new obstacles. The mechanics are simple to grasp. Bob walks continuously in his sleep regardless of potential danger or death – upon confronting a wall or obstacle he will simply take one quarter turn clockwise and continue on his way. This allows the strategic placing of obstacles to steer him in the intended direction. Additionally the game provides a valuable aid in the form of small footsteps on the floor preceding Bob indicating where exactly his next few actions will take him. 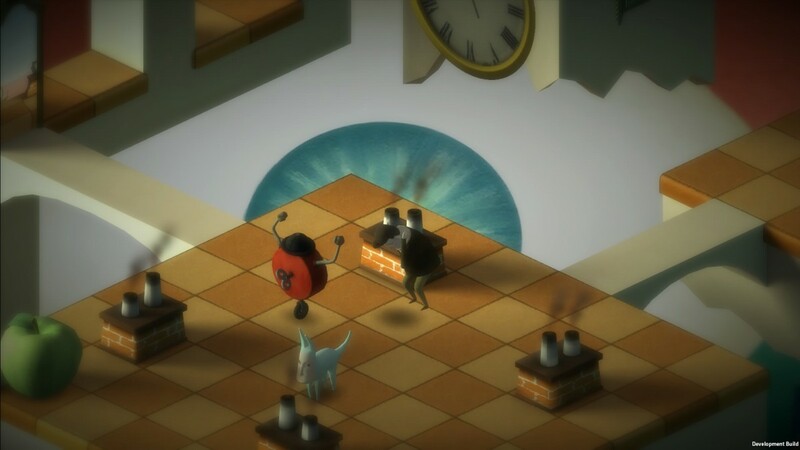 For a puzzle game, Back to Bed is reasonably fast paced. A number of levels rely less on your ability to plan and more to do with your accuracy in racing Bob to the next obstacle. Failure tends to have inconsistent consequences, Bob walking off a cliff edge plummeting to his doom results in a return to his origin point. Walking into a clock shaped enemy however stops the level and forces you to retry with all your strategies reset to default. Landscapes are three dimensional and follow a block format jazzed up with weird and wonderful images and moving parts. They do the job for the most part, occasional frustrating visual aside where the correct solution to a puzzle is hidden due to faulty depth perception in the design. I’m gracious enough to accept that this may be an intentional ploy to increase difficulty but the fact that I’m not sure suggests it’s an issue. While appreciating that Back to Bed is a puzzle game, a little more variety visually would have been welcome. Twenty minutes into my play through I found myself desperately craving something else to look at (little realising twenty minutes was enough to have completed almost a quarter of the game). The change did eventually come but it was a small token gesture and only occurred once in the whole play through. 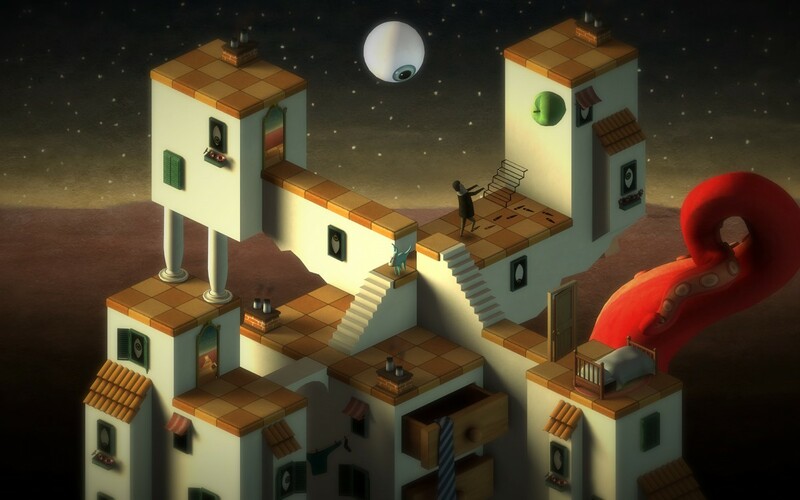 It is apparent that the surrealism and strangeness are an attempt to generate some intrigue in what is otherwise a very bland game. As mentioned twenty minutes is enough time to have completed a significant portion of the game. The whole thing consists of only thirty levels. Allowing for the increase in difficulty with progression, the whole game is completable in two hours or less. Additional challenge is provided via the ‘Nightmare mode’ unlocked upon completion of the initial play through, though this mode is essentially the game repeated but with increased difficulty. I have to admit I didn’t go to the effort of completing ‘Nightmare mode’, I played through maybe three quarters of it before stopping. I stopped not because the game had become too hard for my meagre skills but because I genuinely felt no need to continue. There are no leader boards or end of level rank. There truly is no incentive to come back and continue playing a second time. After playing the ‘Nightmare mode’ it is difficult to imagine why the developers chose to include the initial play through and not just make ‘Nightmare mode’ the standard setting. Back to Bed has little to no story. It has one in principle with the guiding a narcoleptic to bed theme but it never progresses from concept to narrative. I believe the game contains four cutscenes, cutscenes which are actually just pictures, pictures which contain speech bubbles, speech bubbles which contain…nonsense. Where you would expect to find words fleshing out the story, you actually just find cryptic quotations I could make little sense of with regards to the game I was playing. Far from being a negative I actually liked this; rather than attempt to produce a half baked story the cutscenes actually act as a vehicle enhancing the games surrealism and weirdness. Back to Bed is a reasonably good game; whilst it fails in some areas, those areas in which it does well it does very well. It’s main strength lies in its ability to attract non-gamers. The game is very simple with little coordination or gaming ability required – as a result my wife felt the need to issue orders, direct and take part. She would be the first to admit that she can barely tell the difference between L1 and X but she does enjoy puzzles. A game which encourages her to participate in my hobby genuinely deserves credit. The lack of story and it’s genuinely odd visuals may dissuade some from trying the game and I genuinely don’t know if a case could be made to convince them otherwise. I can however state that I enjoyed the game for what it is and generally managed to forget what it isn’t.